Rad Free is a dietary supplement to support healthy aging,the immune system, vascular functions and skin health. Nutritional Frontiers uses the patented and researched ActiVin, the active extracts found in grape seed extract, including OPCs, are powerful antioxidants that have been shown in research studies to promote cardiovascular, brain, skin and eye health; and antibacterial, anti-viral, and anti-inflammatory activities. More than 90 research presentations, publications and abstracts have reported the health benefits of grape seed extract focusing on areas related to antioxidant activity, cardiovascular health, gastric health and anti-inflammatory properties. Research about ActiVin® grape seed extract is published in peer-reviewed journals, including Toxicology, The Journal of Medicine, and Fitoperia, and additional research initiatives are underway to further understand the health benefits of grape seed extract. For those with recurrent or persistent skin or respiratory concerns (due to its ability to regulate histamine) as well as those that need improved joint, immune, circulatory and vascular support. Do grapes, wine, or grape seed oil have the same positive health benefits as grape seed extract? Wine and grape seed oil contain very small amounts of OPCs and cannot compare in antioxidant potency to grape seed extract. For example, you would need to eat 1.0 pound to 1.5 pounds of seeded table grapes to receive the same antioxidant benefits as 50 mg of ActiVin® grape seed extract. ActiVin® grape seed extract uses the patented, environmentally friendly ActiPure® natural water extraction process. This process is able to recover more of the potent OPCs from the grape seed proanthocyanidins. Citrus Bioflavonoid Complex Flavonoids demonstrate potential antimutagenicity ability as well as antioxidant activity. Recently, studies have taken a look at flavonoids’ role in the prevention of carcinogenesis, as well as in the maintenance of capillaries. RAD FREE supports capillary strength. Weak capillaries can contribute to bruising, elastin and collagen dysfunction, edema, and circulatory insufficiencies. RAD FREE also has the unique ability to bond to collagen fibers. It even inhibits the natural enzymes your body makes that normally break down collagen. By restoring collagen, grape seed extract helps return flexibility to skin, joints, arteries, capillaries, and other tissues. 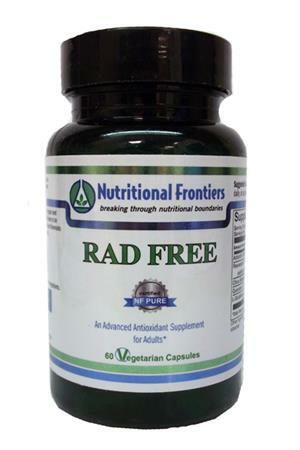 RAD FREE is a dietary supplement to support healthy aging, the immune system, vascular functions and skin health. RAD FREE seeks to enhance capillary strength and even has the unique ability to bond to collagen fibers and inhibits the natural enzymes your body makes that normally break down collagen. By restoring collagen, Grape Seed Extract helps return flexibility to skin, joints, arteries, capillaries and other tissues. Other Ingredients: vegetable cellulose, vegetable stearate. This product is vegetarian and free of corn, egg, gluten, milk, rice, sodium, soy, wheat, yeast, added sugars, starches, synthetic, dyes, artificial flavorings and preservatives. Available in: 60 Vegetarian Capsules.